A Pittsburgh Cincinnati Chicago & St. Louis Railroad (Little Miami Line) train has just arrived. Pedestrians are making good use of the new trestle. According to newspaper accounts the Columbus Street Railway Co. spotted several horse cars in the two tunnel portals to keep them from being used by horse drawn wagons and pedestrians. The camera is looking north in this photo from the Donald A. Kaiser Collection. By 1891 the electric streetcar had become a practical replacement for the horse powered streetcar. The Columbus public and City Council wanted electric streetcars on High Street, the busiest streetcar route, as soon as possible. However, there was a problem – The taller electric streetcars with their trolley poles wouldn’t fit in the tunnel under the railroad tracks at Union Depot. One solution was to enlarge the tunnel by lowering the floor which the city council did not want. Planning was already under way for a new station with a High Street viaduct over the tracks. The council was concerned that if the tunnel was enlarged the railroads wouldn't participate in the viaduct project. 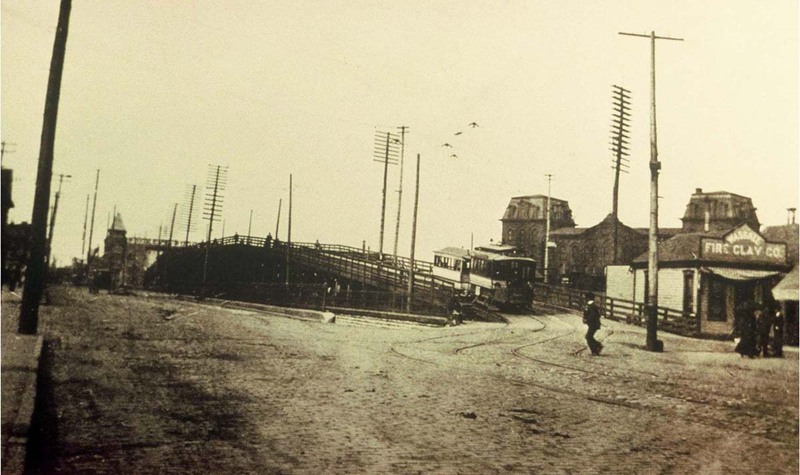 The other possibility was to build a temporary trestle over the tracks just for the streetcars. A temporary trestle to be built on railroad property was selected with construction starting on September 1, 1891. It was completed on September 14 just in time for the 1891 Ohio State Fair. Photo from the Donald A. Kaiser Collection. The trestle is shown under construction in September, 1891. Three small buildings and a pole had to be moved to make space for the trestle. According to the newspaper it cost $800-900 to move the pole used by Western Union and Central Union Telephone companies. The pole was one of the largest in Columbus. Two men can be seen working on the wires. In this photo the tunnel is still in service. The helper mule used to pull the streetcars up the ramp can be seen waiting for the next streetcar to come along. The above photo was taken the same day as the photo at the top of the page. A PCC&ST.L (Bradford Line) freight train is westbound and either a PCC&St.L or a Cleveland Cincinnati Chicago & St. Louis Railroad (Big Four) passenger train is inbound. Four electric streetcars can be seen on the trestle. A view looking east from the Little Miami tracks toward the High Street trestle. Photo from the Ohio Historical Society Collection. In the early years of electric streetcars, on lines with heavy traffic, the motor car would pull a trailer, typically one of the better horsecars. On rainy days the motor car had to sand the rails to get up the trestle grade with a loaded trailer. 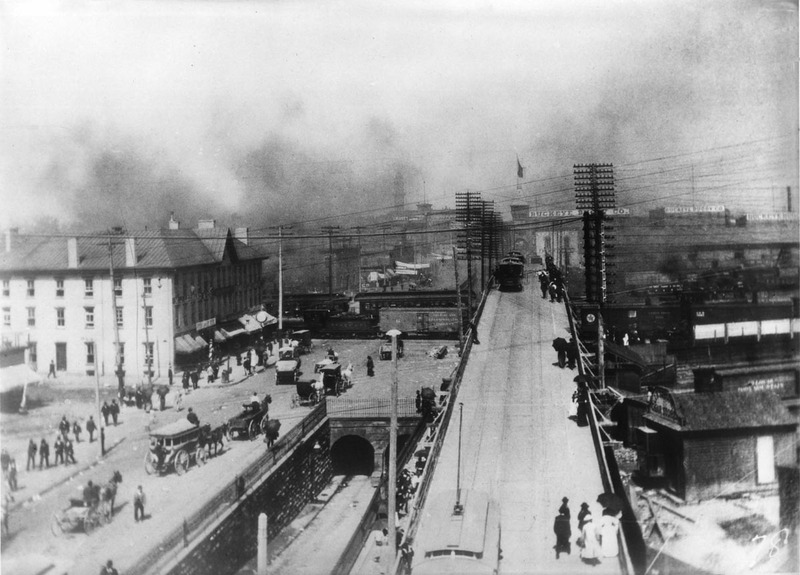 The temporary trestle was in service for only thirteen months. 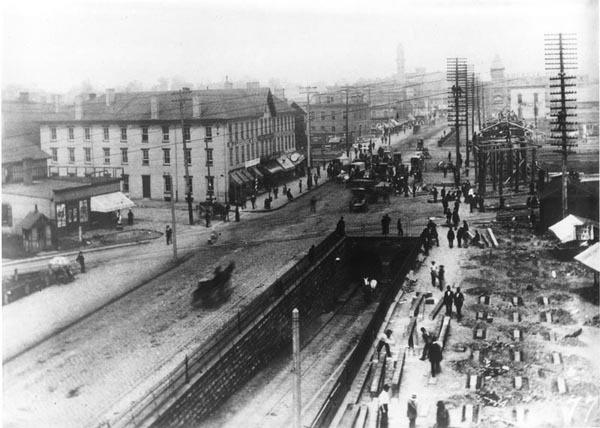 Construction of the new permanent High Street viaduct would begin in 1893. This required removing the trestle and relocating the High Street streetcar line. 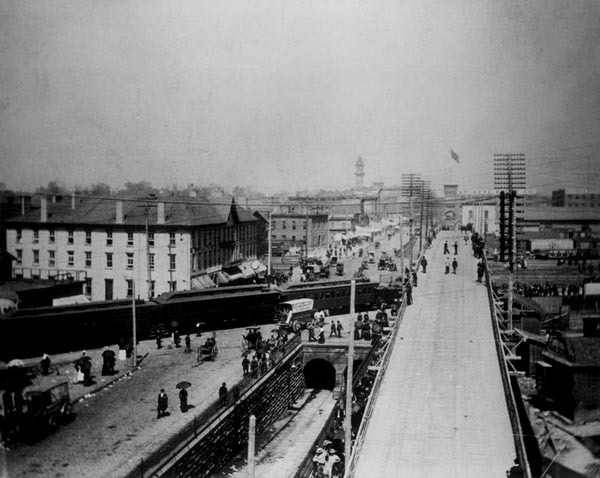 The relocation was made possible by a new Fourth Street viaduct over the railroad tracks that opened in August, 1892. The streetcar detour turned east on East Chestnut Street, north on Fourth Street, and West on East Goodale Street bring the line back to High Street north of the depot construction. The new Union Station reused the 1875 train shed. The passenger handling facilities had to move to a temporary depot on the east end of the property near Fourth Street during construction. Having the streetcar approach the depot from Fourth Street was convenient for passengers using the temporary depot during construction. In 1897 the Third Union Depot, now called Union Station, was complete.